The instructions in this section are designed for a Partner or Partner Employee to initially configure a Customer and test Broadband communication using WAVE Mobile Communicators. Whether you are using radio integration or not, you will need to follow these instructions in order to setup a Customer, Talkgroups, and Users. Note: These instructions assume you have already established a WAVE Partner or Partner Employee account. Customer Employees and Users cannot create Customers. If you are a Customer, then skip to STEP 2 and begin adding Users. In MSI Sales Person Email, enter the email address of the MSI Sales Person associated with this Customer. In Partner Sales Person Email, enter email address of the Partner Sales Person associated with this Customer. 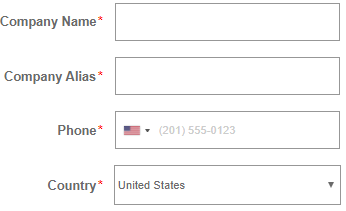 In Company Alias, enter an alphanumeric identifier for your Customer. Users with Portal Access use this to sign in to the Portal. In Phone, enter the phone number for this Customer. In Country, specify the country of for this Customer. Enter the following information in the Customer Admin User section. In First Name, enter the first name of the Admin for this Customer. In Last Name, enter the last name of the Admin for this Customer. 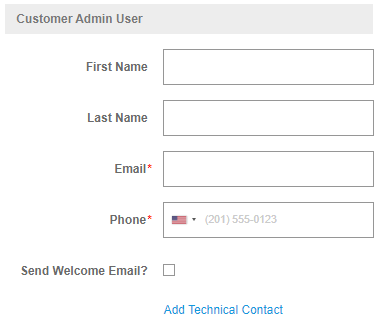 In Email, enter the email address for the Admin of this Customer. In Phone, enter the phone number for the Admin of this Customer. Select Send Welcome Email if you want the Customer to receive an email providing them with instructions. Click Add Technical Contact if you need to add a Technical Contact to this Customer. A Technical Contact should be a trained technician who can answer questions about the account and make changes if requested. A Technical Contact is optional. 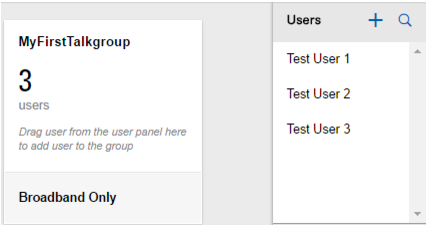 In Number of Talk Groups, specify the number of Talkgroups associated with this Customer account. In Number of Licenses, enter the number of licenses associated with this Customer account. Licenses determine how many users by sign in simultaneously. In Radio System Type, select the type of radio system this Customer will integrate with. Review the Summary. If the Summary is correct then click the SUBMIT button. If you need to make corrections, click BACK. The new Customer has been added and will now appear in the Customers list. The Wizard automatically returns to the first page so that you can enter additional Customers. In a Customer menu, click the Users button. In Phone Number, enter the phone number for this user. Select Allow Portal Access if you want this user to be able to sign in to the WAVE Portal. They will be able to create their own Talkgroups and add Users to those Talkgroups. They will also be able to add Users but cannot delete Users they have not created. You must supply a WAVE Portal account name and password for this user to sign in to www.WAVEOnCloud.com. 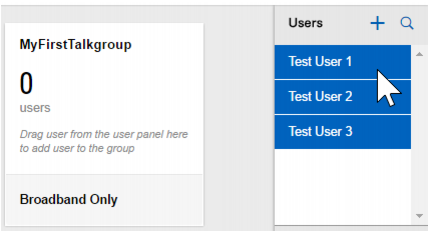 In the Talkgroups section, select the Talkgroups this use will have access to. Repeat steps 2 through 5 to create several Users for testing. In the Select a radio system list, leave the selection as ‘None’ for a Broadband-Only Talkgroup. You can edit Talkgroups later if you need to add or remove a Radio System. Radio/Talkgroup association will covered in Radio Quick Start Configuration For now you will create a Broadband Only Talkgroup. In the Talkgroup screen, press and hold the CTRL key and click the Users on the right of the screen. 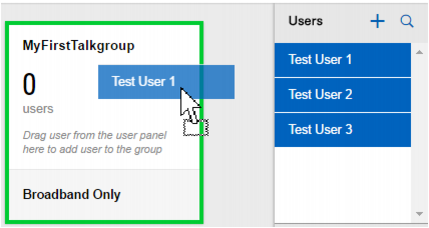 Drag the selected Users into the Talkgroup square. 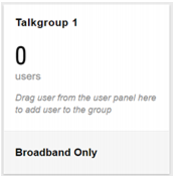 The number of Users in the Talkgroup updates to display the total count. Your first Talkgroup and your test Users are ready for operation. Follow the instructions provided in the email or search for WAVE OnCloud Push-to-Talk in the store. Download and launch the application. When prompted, you must ALLOW the application to record audio, access the device’s location, access contacts, make and manage phone calls, and access photos, media, files, send and view SMS messages on your device. WAVE requires access to your Contacts in order to provide the capability to call them from the client. WAVE requires access to your Phone in order to make phone calls to your Contacts and handle minimization when incoming cellular calls occur. WAVE requires access to media files to transmit them via the application. When prompted, do not optimize battery usage. This will interfere with background operation. The End User License Agreement (EULA) page is displayed. You must read and accept the EULA to activate the PTT service on your phone. Tap Yes to confirm activation. If prompted, enter the activation code given to you by your Customer or Operator to activate the PTT application. This should be sent to you via email or SMS. If you do not receive an Activation Pass-Code then contact the Customer owning this account and ask them to generate an Activation Pass-Code for you. The WAVE Client application contacts the server to retrieve contacts and groups (if any) before logging in. If you receive an Information notice, then see step 8. If you do not receive an Information notice then skip to Step 9. Information notice: if your phone number does not exist in system, then you will be prompted to create a new trial account. If you would like to start a free trial account with yourself as the Customer, then click Free Trial and follow the prompts. You will be granted a free trial license for 30 days and you will be able to create your own TalkGroups and invite your own Users. Enter the required information and then tap the SIGN UP button. Enter phone numbers of users to invite and then click the INVITE button. You may invite up to ten people. They will receive SMS instructions to sign up to your account as users. Tap the GO TO HOME DASHBOARD button to open the WAVE Customer Portal for your account. Once the WAVE Application launches, you will be offered the chance to view the Tutorial. If you tap Skip Tutorial you will be taken to the application main page. You may launch the tutorial any time you wish from the menu. Once the application launches, it should show ‘Available’ at the top. You are now ready to begin using the new WAVE Communicator. Using another device, sign in to WAVE via the WAVE Application. In the Talkgroups tab, tap the name of a Talkgroup. The screen for the selected Talkgroup opens. Repeat this with the other device so that you are on the same Talkgroup. On one device, press and hold the PTT button. You should hear a short chirp. Speak into your microphone. The audio should come out clearly on the other device and a record of the transmission should appear.